I’ve been working on a couple of projects that were going to be gifts, so I wasn’t able to talk much about what was happening in the workshop. But they’ve been delivered, so here is a recap. The first project was a commission for another music stand to be a graduation present for a Music/English major here at Rio. I used the opportunity to expand my skill set, since there was no new design work to be done. Instead of attaching the legs with a routed dovetail, I used the table saw to rough in the dovetails on the legs, and then my old Disston No. 68 dovetail saw to cut the matching socket and a chisel to pare out the waste. I think the most challenging aspect of this method is trying to carve a curve in the leg’s shoulders to match the curve of the post. You definitely need a well sharpened gouge to work on the end grain. other than that, I certainly prefer it to the jigs and fixtures needed to get the grooves routed. The second gift was for Mother’s Day. It was a side table to sit next to a big recliner with a storage area under the top. The picture I was shown had a basic box on legs with a shelf underneath. 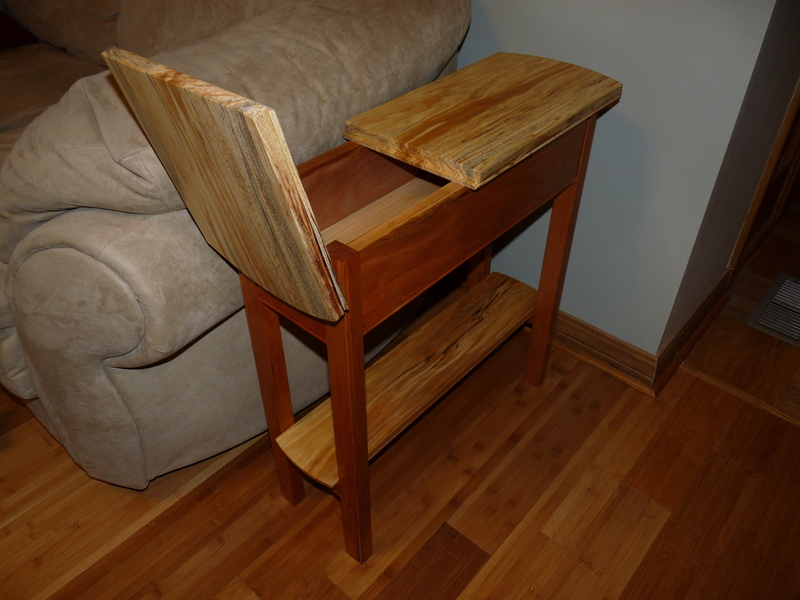 What I didn’t like about it was that the top opened via a hinge by folding back on itself. Which means that when you open it, you can’t have anything on the stationary part of the top. So, aside from jazzing up the design a bit with some curves, I had the moved the hinge to the end, so that it opened out. Also, to make it easier to retrieve items towards the back of the “fixed” part, I attached the rest of the top with buttons in a groove that ran the full length of the “fixed” top. That way it can slide back, while at the same time allowing for any wood movement. 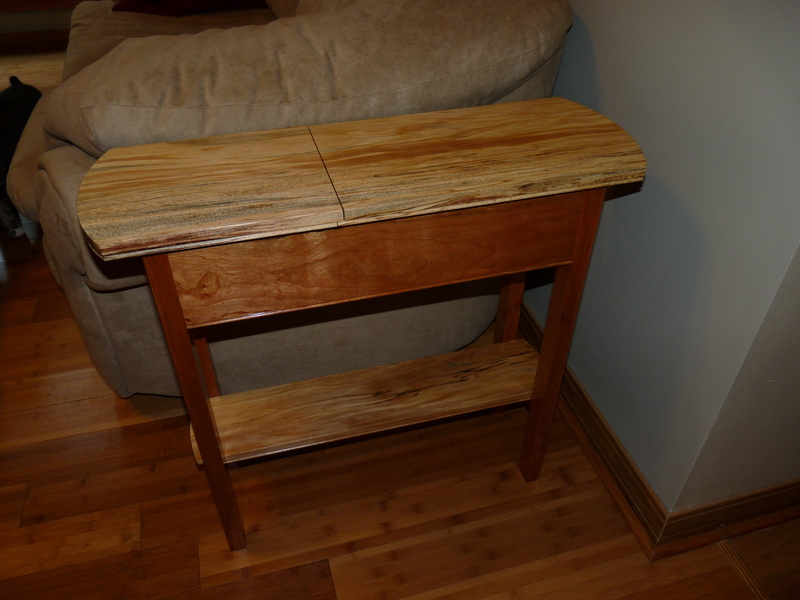 I used cherry for the legs and aprons, and spalted sycamore for the top and shelf. And with the open part opened. This entry was posted on May 18, 2010 at 5:37 pm and is filed under Acorn House. You can follow any responses to this entry through the RSS 2.0 feed. You can leave a response, or trackback from your own site.